Take your life to unreached heights with a Personal Results Specialist today! So often we sit around, thinking about how unhappy we are about one thing or another. Here’s a secret: the only person capable of changing your life for the better is you. You are the only person who can go to the gym, talk to your partner or open your own business. So why don’t you? It starts with self-doubt. “Maybe I shouldn’t really do this,” we think. “Maybe it’s not a good idea.” We ask ourselves over and over again if we really should bother lifting weights or eating better. It’s not going to work anyway, is it? You’ve tried it before and it didn’t work then. And everyone has a job they don’t like. Failing would be terrible, so you don’t even try. The key to following through when you’re committed to change is to fight off your fear of failure. Of course you’re afraid; any sort of change can be frightening. But if you fail to even try, then you’ll be exactly where you’ve always been. You might not fail, but you also won’t grow. You won’t learn. We’ve established that if you get in your head, you’re dead. The brain is a great tool to strategize with, but there’s a point where you have to use your heart, put yourself on the line and do something. So don’t think too much. Instead, commit to a decision, act on it and move yourself forward. A lot of people tend to make “sorta kinda” decisions: “I’ll do this… someday.” Here’s the secret behind why people don’t follow through: The reason people don’t commit to a decision is that they don’t act on it. You may have thought that it’s the other way around – that you have to commit to a decision before you act on it. But the only way to prove to yourself that you’re completely committed to change and are going to follow through is if you push yourself to take the first step, which is the hardest step to take. You don’t have to do this alone. Committing to change is easier when you face it with someone who’s been there. Find someone who has achieved the results that you want – they lost 30 pounds, or they have their dream career or they’re just truly happy with their life. Finding someone who inspires you in this way is called modeling, and it’s a great way to determine the steps you need to take to reach your goal. People don’t achieve repeated success because they’re lucky. They achieve repeated success because they’ve found something that works – a formula, a strategy or a tactic – and they’ve repeated it, adjusting as necessary. Find out what steps this person took to get where they are today. What decision did they commit to and act on that pushed them forward and made them take that first step into the future they wanted? You can follow their method, changing it here and there to better apply to your own needs. What’s one small decision you could make right now that would take you in the direction you need to go? What’s a big decision that might be really tough, but if you made it, it would take you in a new direction in your life? Write these things down, and start making plans to see them through. They may not happen instantly – they will probably take time and effort – but writing something down is a powerful way to tell yourself you’re going to make something happen. They aren’t just words in your mind anymore. They’re words on paper, a list you can look at again and again. If you don’t act, your dreams will die in your mind. When you make a decision, commit yourself to it by taking the first step toward it right then and there. Otherwise, you’ll go home, get caught up in the 87 other things you need to do and you won’t make any headway. Take some form of action that will move you in the direction you want to go. Sign up for the membership at the gym. Start thinking about what you want your career to look like. Maybe you need to take a class or read a book to start learning new tactics to improve at your job. The smallest of changes can lead to big results if you follow through with them. When you’re committed to change, life starts to look different. You stop fearing what might happen and instead embrace it. So what if you fail? At least you learned something – that means you’ve grown. By shifting the way you approach things and realizing that only you can make a difference in your own life, you’ll change the way you think about yourself and the story you’re living. Ready to make the change you need? 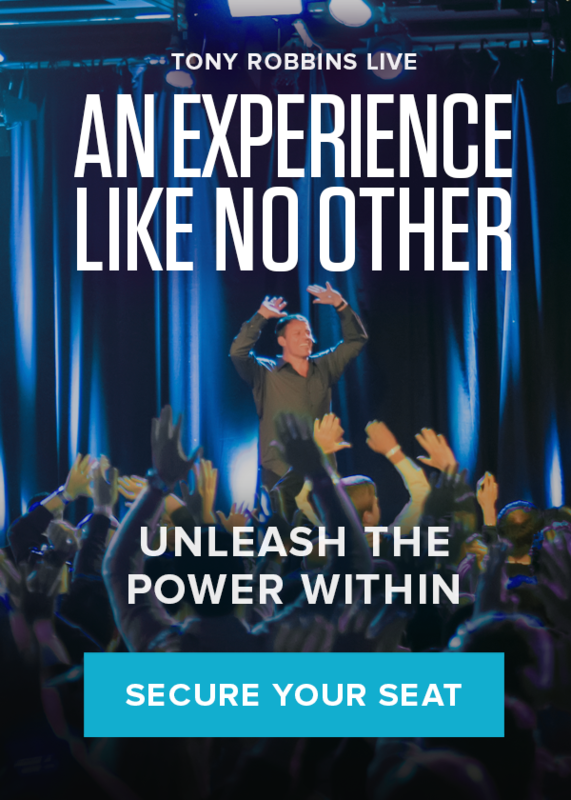 Unleash the Power Within is a 3 ½ day immersive experience designed to help you break through your personal barriers and live the life you deserve.